“Maybe these are woolly mammoth tracks!” I yell with a laugh. 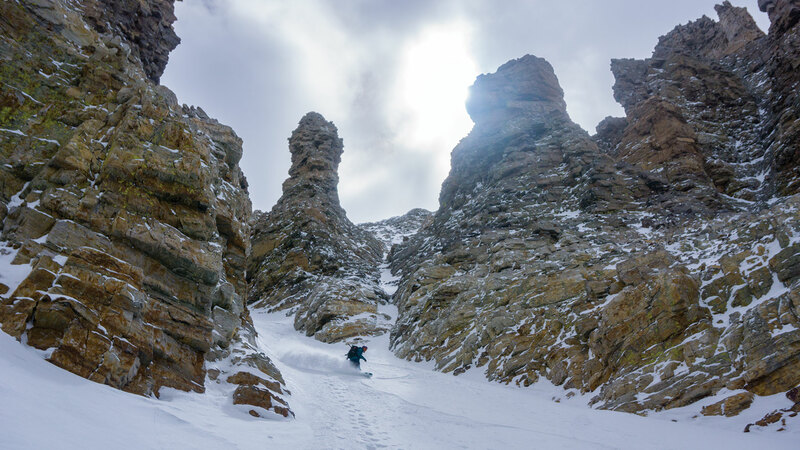 My wife Allison and I are backcountry snowboarding in Great Basin National Park on the far east side of central Nevada. 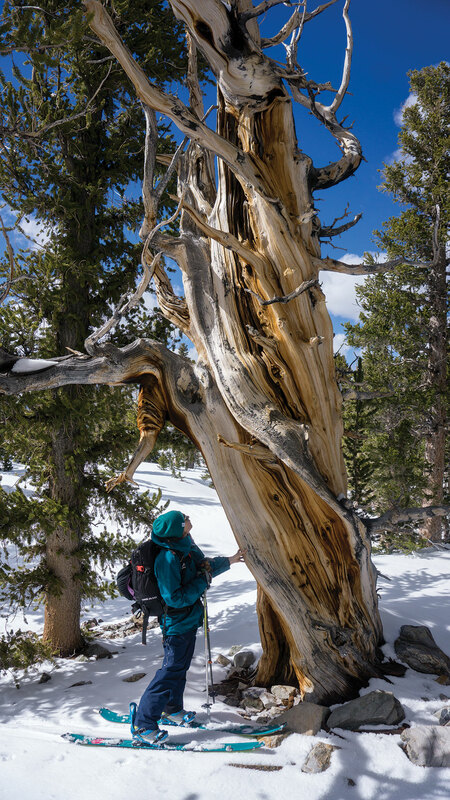 We’ve just climbed onto a bench at 10,000 feet on the flank of Wheeler Peak and are ski touring through a stunning grove of ancient Great Basin bristlecone pine trees. The tracks in the snow are obviously from deer, but the scene in our sights—the utter remoteness combined with the thick, gnarled trees—sure looks prehistoric. Like rosy-cheeked, bright-eyed skeletons, the bristlecone pines stand tall among the otherwise shrubby high desert terrain with half-dead, half-alive golden trunks gleaming in the sun. Some of these trees are nearly 5,000 years old and are among the oldest living organisms on earth. Despite their age, the bristlecones still look vibrant with both green branches and old petrified branches radiating skyward. The trees are perched on a rocky moraine with decomposed shale outcroppings poking out from a thick blanket of snow. A towering mountain ridgeline of equally weathered rock rises up straight from the grove. We may have missed the woolly mammoth lumbering through this land by 10,000 years, but the rest of the wild setting feels frozen in time since the retreat of the last ice age. The grove is reminiscent of a sculpture garden. We ski around every tree admiring the intricacies of their bulbous, richly color-streaked trunks. Bristlecone pine wood is so oily and resinous it’s virtually impervious to insects, fungi and rot. The harsh wind, rain and snow that pummel this exposed grove literally erode the wood like stone, forming the unusually contoured shapes of the trees. The cold weather and short growing season also mean the trees grow very, very slowly, giving them time to twist and gnarl. Even the bristlecone’s needles are caught in a suspended animation. Some needles will remain on the tree for 40 years. 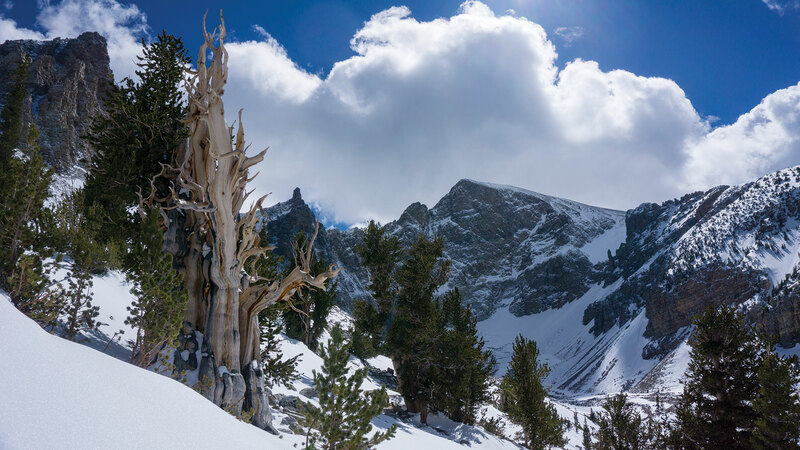 This grove on Wheeler Peak was once home to Prometheus, a particularly old bristlecone that was named by naturalists in the 1960s. In 1964, an overzealous graduate student had the tree cut down in an attempt to date it by counting the rings of a full cross-section. Estimated at 4,900 years old, Prometheus may have been the oldest known living tree on earth at that time. Prometheus’ death, which was granted by the United States Forest Service, sparked controversy and helped ignite a movement to protect the grove. Twenty-two years later, in 1986, the conservation efforts were rewarded as Wheeler Peak and the surrounding area was designated a national park. This backcountry tour was Allison and my first time visiting Great Basin National Park. When we arrived the night before, the park was a complete ghost town. We did not see a single sign of recent activity—no employees at the entrance gate, no lights on in any buildings, not even a single vehicle that looked like it had moved in a month. Compared to a year-round, bustling national park like Yosemite, Great Basin was devoid of human life, as if it were in deep hibernation. But we didn’t need a brochure to tell us why we drove seven hours on U.S. Highway 50 from Lake Tahoe to Great Basin. We’d tracked a cold, powerful storm that lingered over central Nevada for a week. 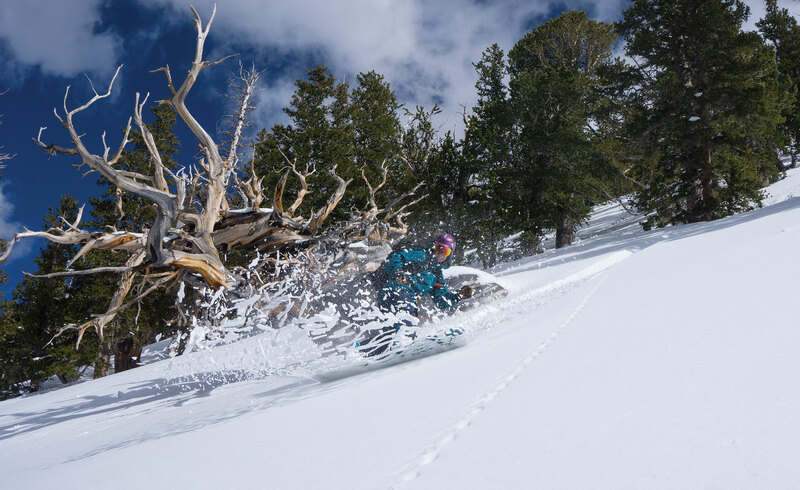 Touring into the bristlecone pine grove was on the radar, but our primary objective was to explore the park’s magnificent backcountry snowboarding terrain in spectacular powder conditions. That morning, before we toured into the bristlecone pine grove, Allison and I climbed a 2,000-foot-long couloir that snakes up a headwall adjacent to Wheeler Peak. 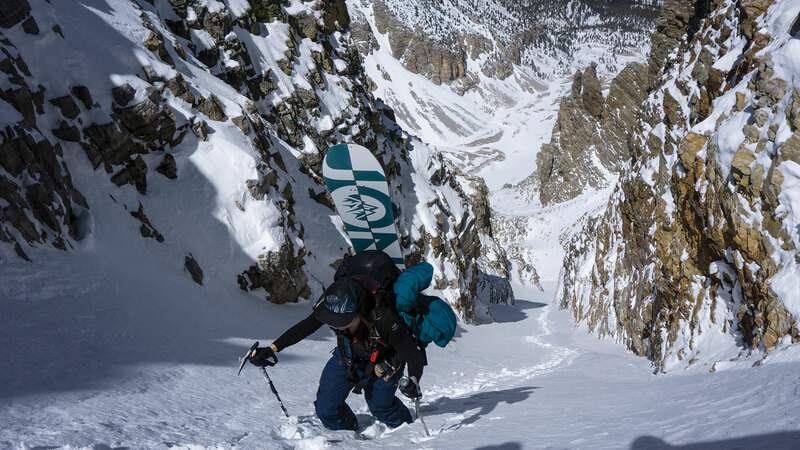 The run down the chute was what we live for as backcountry snowboarders—stable, shin-deep powder confined in a steep hallway flanked by towering rock walls and spires. It was one of those runs where you rip 20 turns then subconsciously stop, not from fatigue, but because you want to soak in the surreal situation a little longer. The bristlecone pine grove was a scenic detour en route to the trailhead after riding the couloir. We had indeed timed our trip to Great Basin just right as even the lower-elevation terrain below the grove was caked with fresh snow. With the sun beaming overhead and warm days in the forecast, we knew full well how ephemeral this opportunity was. And to top it off, we were still completely alone, potentially the only people in the entire national park that day. Just us, the birds, the ancient bristlecones and maybe a rogue mammoth enjoying this frozen slice of time in the wilds of central Nevada. Seth Lightcap is a Truckee-based writer, photographer, snowboarder and mountain biker. Find more of his work at www.sethlightcap.com.